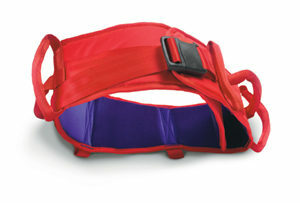 EasyBelt and FlexiBelt are used for sitting transfers or for supporting a patient when standing and walking and are considered far more supportive than a gait belt. It has strong vertical and horizontal handles to provide the best possible grip in different situations. The belt, which can also be placed round the caretaker’s waist or hip, provides a place for the patient to grip during a transfer thereby avoiding grabbing the caretaker. EasyBelt is made of moisture- and soiling-resistant nylon while the FlexiBelt has a gentler, more comfortable polyester surface against the body.